Sri Lankan meals have gained global popularity with their blend of fiery spices, creamy curries, rich flavours and unique textures. The scrumptious dishes of Sri Lankan cuisine provide the country’s visitors with exotic eating experiences. Here’s our guide to exploring Sri Lankan cuisine in the country’s bustling capital, Colombo. String hoppers make up an important part of a Sri Lankan breakfast and are one of the most popular dishes in the country. The pancake-like bites are prepared from steamed rice noodles molded into flat spirals. They are traditionally served with coconut sambol, Dhal and other sauces. While the spicy curries that accompany them might seem novel to some, particularly early in the morning, there’s hardly a more delicious way to start your morning than savoring some string hoppers with a cup of black tea. Along Galle Road numerous restaurants serve local cuisine treats including string hoppers. Many eateries offer a basic setting and are filled with locals looking to taste the delicious cooking. Particularly noteworthy is the Green Cabin, rumored to have some of the best hoppers around. After a long bus or train journey, take a stroll around Pettah’s central station, filled with numerous vendors and food stalls selling short eats and other delicious dishes. Vegetable samosas are a staple of Sri Lankan cuisine and while they can practically be found all over the city, they are particularly popular in this area. Samosas are made by frying up flat bread stuffed with a mixture of vegetables and spices. The triangle shaped treats make for a wonderful quick bite while you are on the run, or they can be served as a sumptuous addition to a creamy curry. The flat breads come at incredibly low prices, but those sensitive to spice should be careful: the tasty samosas tend to be really spicy. Kottu Roti seems to be everyone’s favorite dish when it comes to Sri Lankan cuisine, and it’s hard not to marvel at its perfect balance of flavors. The dish is made from Godhamba roti, vegetables, egg, spices and there are meat options if desired. With its creamy textures and diverse seasoning, Kottu Roti represents a novel and truly rewarding experience for your taste buds and will keep you wanting more. Numerous restaurants serve up the sumptuous meal, yet one of the most popular places to sample the treat is the Hotel de New Pilawoos, a no-fuss restaurant frequented by numerous locals. Within the basic setting, visitors can sample one of the city’s best kottu rotis for next to nothing, enjoying an eating experience that will surely be remembered. There is no way you can leave the country without having tasted an authentic Sri Lankan breakfast. Egg hoppers are prepared by starting out with a light pancake batter to which coconut milk and palm wine are added. While some people prefer them plain, it is also common to toss a fried egg in the middle while the mixture is cooking. The scrumptious bites are prepared in mini woks which makes them crispy around the edges while retaining a soft core in the centre. They are traditionally served with coconut sambal, chilli sauce, chutney or fresh herbs. The crêpe-like hoppers can be found all over the country, however, Colombo offers some of the best restaurants in which to try them out. Wander over to the Grand Oriental Hotel which puts up a hoppers night every Friday and Saturday where visitors can stuff themselves with the tasty fry-ups and take their pick from an extensive buffet. With its prime location by the Indian Ocean, Colombo is a paradise for seafood lovers. Hungry travelers and locals can take their pick from the catch of the day which is presented in front of many seaside restaurants. From crabs to king prawns, butterfish, snapper, lobster and squid, the variety of goods on offer will satisfy a wide range of tastes. Most eateries allow you to have your choice prepared exactly to your liking and accompanied with a number of delicious sauces. If you are looking for a fitting atmosphere as well as some quality grub, make your way to Mount Lavinia, home to variety of seafood restaurants and a popular hangout spot due to its extensive white beaches and tranquil atmosphere. Visitors can enjoy their seafood dishes directly on the shores on romantic tables, while digging their toes into the sand. Woodapple definitely is an acquired taste but it’s worth giving it a try when spending some time in Sri Lanka. The exotic fruit is immensely popular throughout the country and is often also used to make juice. Don’t let the novel smells, a mixture of blue cheese and raisins, scare you off – woodapple has truly sumptuous flavors and tasting it provides a a memorable eating experience. Appearing much like a moldy coconut from the outside, the fruit is usually cracked open and the substance in its interior is eaten with a spoon right on the spot. It bears similarities to a tamarind fruit, with slightly acidic and sugary substances. The unique texture consists of a soft part, crunchy seeds and fruity bristles. A bite of the woodapple can easily be found around Pettah Market, one of the city’s busiest commercial areas with numerous vendors selling fresh fruits and vegetables of great quality. Pani Pol refers to sweet coconut pancakes, one of the most marvelous desserts to try in the diverse country of Sri Lanka. The tasty bites are made from a palm treacle base and stuffed with fresh coconut and sugar. The syrupy sweetness of the Pani Pol bears similarities with Indian sweets and is one of the most popular meals in the country. From restaurants to vendors who drive around with a kind of bakery on wheels, there are numerous places in which to indulge in the exotic flavors of this meal. Some of the best Pani Pols can be found in the Dehiwala and Wellawatta area around Galle Road. The bustling district is home to a variety of restaurants and street food stalls which fry up some of the delectable treats and serve them at low prices. The Sri Lankan-style Dal curry bears strong similarities to its Indian counterpart, however many are convinced that this take on the popular dish is superior. The dish consists of fresh coconuts, spices and chillis, making it not only incredibly tasty but also healthy as it is packed with protein and fibre. 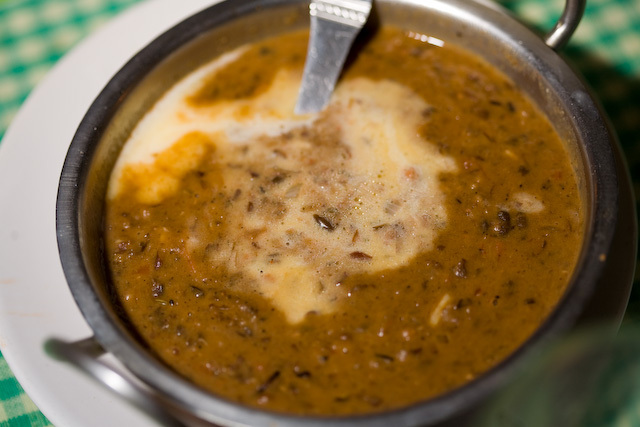 Dal curry can be served at all times of the day and accompanies numerous dishes in the country. The secret to a perfect Dal curry lies in cooking the ingredients to tenderness before overboiling it, leading to it loosing its creamy texture. The dish is best accompanied by some rice or roti. Upali’s is one of the best restaurants in the city to sample authentic local cuisine with a focus on balanced seasonings, scrumptious flavours, and great service. This is one of the most popular eateries in which to try out Sri Lankan curries.